Quick and timely considerations for your mineral program. 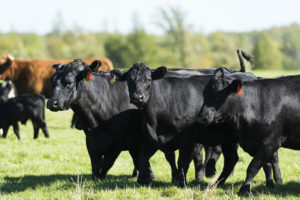 If using a mineral form of fly control, consistent intake is key. Consider using Wind and Rain Storm Fly Control Mineral with Altosid (IGR) in either granular or tub form. To help achieve consistent mineral intake, use enough mineral feeders for your herd size. A good rule is to use one feeder for every 20 to 30 head. Use water as a tool to adjust intake. If mineral intake is lower than desired, move feeders closer to water sources. If intake is higher than desired, move feeders further from the water. As grasses start drying, antagonists can block absorption of minerals. If antagonists are a concern, consider using a mineral with Availa 4. If you plan to use a mineral with chlortetracycline to control anaplasmosis, a VFD will be required. Article Attributed to Purina Mills. This entry was posted on Saturday, July 15th, 2017 at 11:46 am	and is filed under Cattle, News & Updates. You can follow any responses to this entry through the RSS 2.0 feed. Both comments and pings are currently closed.